Vesta appears in a splendid rainbow-colored palette in new images obtained by NASA's Dawn spacecraft. The colors, assigned by scientists to show different rock or mineral types, reveal Vesta to be a world of many varied, well-separated layers and ingredients. Vesta is unique among asteroids visited by spacecraft to date in having such wide variation, supporting the notion that it is transitional between the terrestrial planets -- like Earth, Mercury, Mars and Venus -- and its asteroid siblings. In images from Dawn's framing camera, the colors reveal differences in the rock composition associated with material ejected by impacts and geologic processes, such as slumping, that have modified the asteroid's surface. Images from the visible and infrared mapping spectrometer reveal that the surface materials contain the iron-bearing mineral pyroxene and are a mixture of rapidly cooled surface rocks and a deeper layer that cooled more slowly. The relative amounts of the different materials mimic the topographic variations derived from stereo camera images, indicating a layered structure that has been excavated by impacts. The rugged surface of Vesta is prone to slumping of debris on steep slopes. Dawn scientists presented the new images at the American Geophysical Union meeting in San Francisco on Monday, Dec. 5. The panelists included Vishnu Reddy, framing camera team associate, Max Planck Institute for Solar System Research, Katlenburg-Lindau, Germany; Eleonora Ammannito, visible and infrared spectrometer team associate, Italian Space Agency, Rome; and David Williams, Dawn participating scientist, Arizona State University, Tucson. 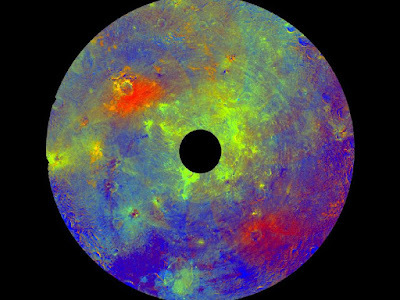 "Vesta's iron core makes it special and more like terrestrial planets than a garden-variety asteroid," said Carol Raymond, Dawn's deputy principal investigator at NASA's Jet Propulsion Laboratory, Pasadena, Calif. "The distinct compositional variation and layering that we see at Vesta appear to derive from internal melting of the body shortly after formation, which separated Vesta into crust, mantle and core." The presentation also included a new movie, created by David O'Brien of the Planetary Science Institute, Tucson, Ariz., that takes viewers on a spin around a hill on Vesta that appears to be made of a distinctly darker material than the rest of the crust.